The 11,406grt Snow Crystal of Salenrederierna A/B was built in 1973 by La Ciotat CN. On 1st July 2010 she arrived at Alang to be broken up. 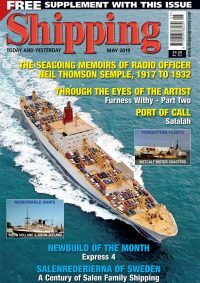 Our popular supplement is again provided FREE with this month’s issue of Shipping T&Y. Listing all the current* ocean going cruise ships alongside their gt, pax and operator information. It includes casino ships and cruise ships currently laid-up.